Vietnam is a country rich in history and breathtakingly beautiful scenery, which will always make it a popular country for those backpacking in South East Asia. However, journeys in Vietnam are not something to be admired. The first clues were there once we arrived at Hanoi airport. We managed to avoid the eager taxi drivers and found ourselves on a shuttle bus, costing the two of us only 60,000 Dong (less than £2). A great bargain for a relatively long journey, but we did have to share the 11 seated shuttle with 13 people and 13 rucksacks. It was very overcrowded, but for such a bargain we weren’t going to complain, mainly because we weren’t the ones who had to sit on rucksacks. We were given two important pieces of information from tour guides during our time in Vietnam. The first was – if you are trying to cross a road then the best thing to do is walk slowly across whilst holding your hand up in the air, so that motorists know you are crossing and mopeds can drive round you easier. 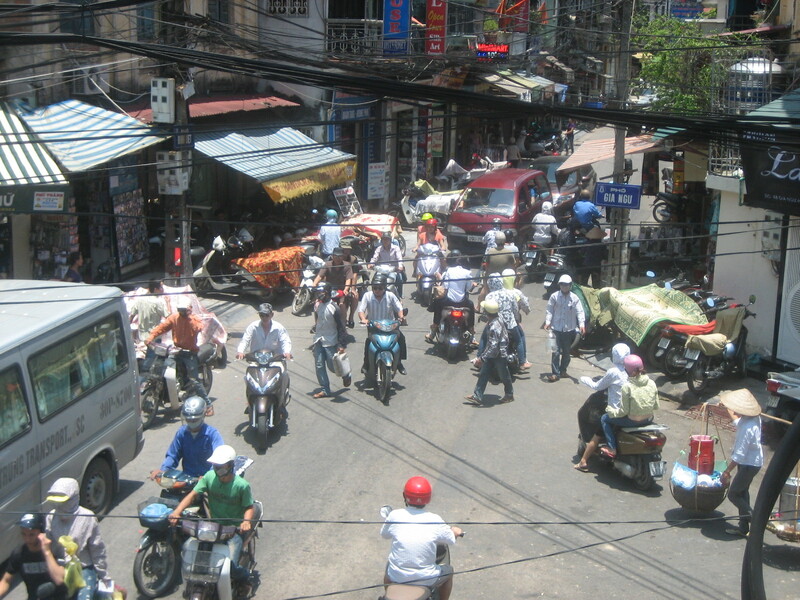 Hanoi is diverse, busy and exciting. The highs and lows of our day trip to Ha Long Bay reflected our whole 2 weeks in Vietnam. The scenery was astounding and the place was beautiful, but the drivers and tour guides constantly overfilled the transport and appeared to have no idea what they were doing. Each trip that we made felt as though it was the first time that the tour guides had ever made the journey and they had no idea how to organise it. When I mentioned that I was a vegetarian I thought the person I spoke to was going to have a heart attack. When you have kayaked in the beautiful bay and walked through their caves, all the issues feel insignificant. However, the fact that the driver of our shuttle bus decided that he didn’t want to drop us off at our hotel, but basically abandoned us several streets away leaving our guide to lead us back to our hotel was ridiculous. Our night bus to Hue was much more traumatic. We were picked up by a mini bus, but then had to wait for half an hour while the driver fetched the other passengers. Not long after setting off we soon stopped again to cram in more passengers, so many in fact that the driver’s colleague had to stand on the edge of the van as it took us to the night bus. The bus set off around 7:15pm and I was constantly in and out of sleep, not just because of the stops to pick up more passengers, but because of the driver constantly beeping his loud horn! You see, a certain Vietnamese trait is to beep the horn whenever anything happens on the road, including overtaking other vehicles, being overtaken by other vehicles, turning a corner, stopping, passing pedestrians and cyclists (even if they are not on the road), speeding up, slowing down and sometimes just beeping when there’s no one near them and they’re driving in a straight line. By the time we arrived in Hue at 5am I was truly in need of a good night’s sleep. Our next journey a few days later was a mere 6 hour bus journey to Hoi An. As it was not a night bus we naively believed this would be a much more comfortable journey. However, when the bus picked us up it was full, so we had to sit on tiny plastic stools in the aisle. Thankfully this only lasted for about 10 minutes before the bus stopped and about half a dozen of us had to get off and find our bags that we had just spent a few minutes trying to squeeze on. We were told to wait further down the road for another bus that would be taking us. We hung around wondering what was happening for another 10 minutes when the bus we had got off pulled back up to us, unloaded more passengers and we had to get back on. At least we were able to sit next to each other, which wasn’t the case for another couple who weren’t so fortunate. As the only remaining pair of seats were reserved for a woman from the bus company, the guy had to squash onto the back seat, while the girl had to sit at the very front on a dodgy looking unsecured seat. The air conditioning didn’t work for the entire journey, so passengers cracked open windows and from time to time the driver opened the door to let in some air. However, the driver did not like the windows being open, so when we stopped for a toilet break he walked around the bus and closed all the windows from the outside. At our next stop an hour or so later he did the same thing, this time giving me a smack on the arm before slamming my window shut. 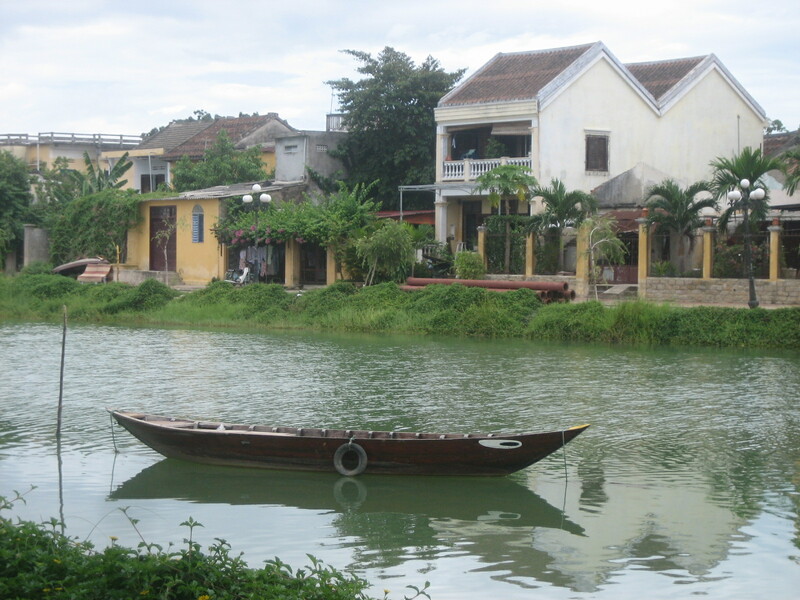 We were glad to reach Hoi An, as the driver had also turned the journey into a race, as he sped alongside another tourist bus as they tried to overtake one another, in what seemed a desperate attempt to reach the destination first. Hoi An is a beautiful town. The buildings are a lovely yellow colour and it was a truly pretty town to walk round and explore. 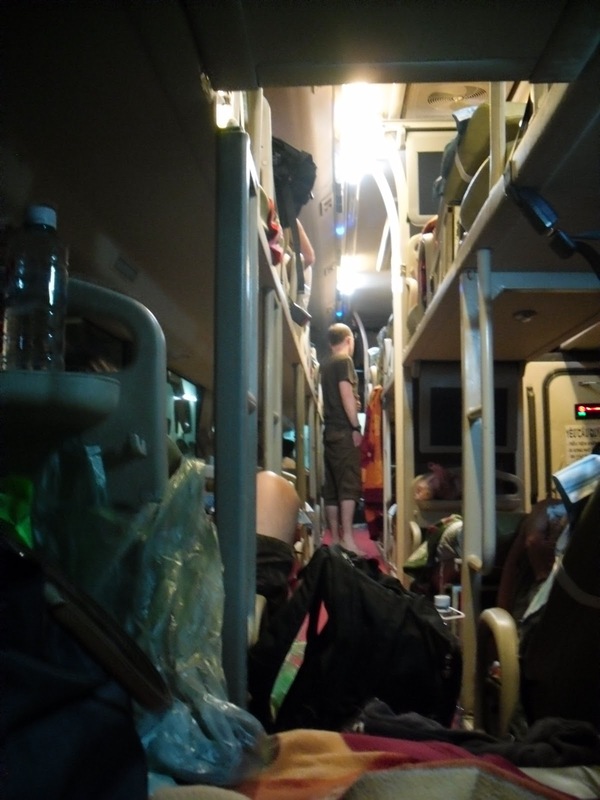 However, our next journey to Nha Trang was another night bus and had all the same problems as the previous journeys. Once again we believed it would be better this time, as the tour operator we booked it with actually gave us seat numbers. How foolish we were…not only did the driver not even look at the seat numbers we had been allocated but we weren’t even allowed to sit in the spare seats we wanted. We were told to sit at the back on the bottom row, which was a row of five seats where we couldn’t even sit up straight due to the second set of five seats above our heads. We were crammed in with two Italian guys and an Australian girl, who unfortunately was about 6 foot and as she got the last seat in the middle of us she had no room to stretch her long legs out. I did try and reason with one of the workers, but when I tried to ask why we couldn’t sit in the better seats he simply waved me off, told me to return to the back seat and physically shoved me away. So, I reluctantly returned to the crammed cave at the back of the bus for a long and uncomfortable night. We tried to be clever on our journey to Saigon, by taking a train. That wasn’t such a good idea. A 7 and a half hour journey was spent on a train in desperate need of maintenance Our seats were broken and we struggled to enjoy the wonderful scenery as the the curtains were half pulled across and broken. Women walked up and down the carriage selling raw, not chilled fish, which I thought was a very unusual item to sell on a long train journey. How about fruit or something that didn’t reek of death? Vietnam is a beautiful country, full of history and culture with some of the best scenery I have ever seen, and I am very pleased that I had the opportunity to visit. So, if you can cope with squatter toilets on buses, dangerous driving, being treated like prisoners and never feeling sure that you’ll reach your destination then I highly recommend Vietnam. The second important piece of information that we were given – if you do not like the fast driving in Vietnam the best thing to do is…close your eyes and go to sleep……If only they would stop beeping their horn, then that’s exactly what I would have done.